Store human readable layer name in QGIS style files? 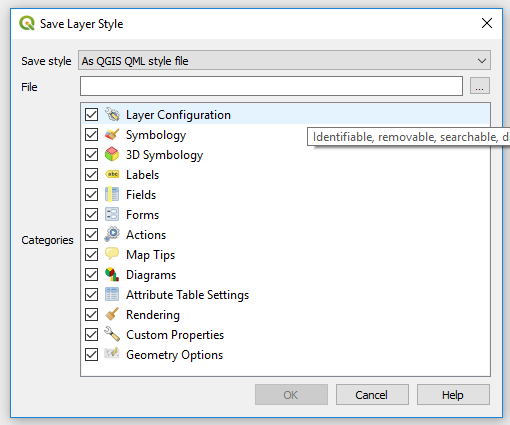 QGIS 2 and 3 as well seem not to store the Layer name (set via Layer Properties | Source | Settings | Layer name or via 'Rename' in the layers context menu) in styles files. I.e. if i have a PostGIS table 'flst_teil' and would like to have it in the Layers Panel in a nice human-readable form like 'Flurstück Teil'. Is this intented behaviour or a bug? Do I have a chance to achieve this or do I have to rename the layers any time I load them? "Layer name" is not stored in the QML file. It will be stored in a saved project, but not in a style file. I think in the past (when you could not choose what parts of the style to save) this would not have been a good improvement. Since you would often copy styles from one layer to a completely different one. But saving the layer name in the "Layer Configuration" does make sense. At least when it has been specifically modified. Not the answer you're looking for? Browse other questions tagged qgis layers style layer-name or ask your own question. Setting default label font in QGIS? How to rename duplicated layers in QGIS3?